Mattel hasn’t always had the best track record when it comes to action figure lines in recent years–at least, not when it comes to keeping collectors happy. Their 2002 Masters of the Universe revamp died out as collectors gave up trying to find that one Evil-lyn amongst the racks upon racks of Spin Blade He-Man. 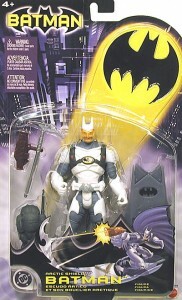 Their 2003 Batman line suffered from many of the same problems–four of the best figures, Bat Signal Batman, Attack Armor Batman, Bane and the Scarecrow were initially available only internationally, and the villains that were available in the U.S. were often shortpacked in favor of the umpteenth Batman in some bizarre outfit. There’s lot of evidence Mattel has learned from their mistakes as the Batman line has morphed into DC Superheroes and then into DC Universe Classics. So far, every buck reuse in DCUC has been to create a look or another character who has appeared in the comics, rather than giving us, say, Arctic Shield Batman. Still, action figure collectors aren’t known for being a particularly patient lot (and I definitely include myself in that characterization), so it’s no surprise that, as they see shipments of DCUC wave 1 fill the pegs at their local retailers while DCUC2 remains scarce, fans have started to worry the line will soon follow the fate of MOTU. Never mind the fact that Mattel is bringing MOTU back this fall. Never mind the fact that, arguably, Mattel’s 6″ DC line has been in continuous production since the first Batman figures were released five years ago, albeit under various titles. Never mind that Mattel hasn’t even canceled the JLU line (which hasn’t had a cartoon to support it for two years), but have worked to keep it going as a Target exclusive. DCUC is intriguing. It’s ostensibly a collector-oriented toy line, with some child crossover, by Mattel’s own admission. And so, it could theoretically be sold solely via the specialty market (comic shops and pop culture stores) and online. But obviously, Mattel wants to maximize profit by selling to the big boys as well. Target couldn’t re-order Wave 1 if Mattel didn’t still have it in the warehouse. Mattel isn’t producing more of wave 1 just to meet Target’s demands–unless Target specifically requested more, which would suggest the line was selling well. Mattel has said sales on wave 2 were bigger than expected; perhaps a lot of those initial cases went to those who ordered them through the online retailers. When your average Target gets maybe two or three cases of a wave at a time, those 600+ cases that go to CornerStoreComics, EnchantedToyChest and BBTS might make a difference. This is the way it seems to work these days–there’s an initial shipment of a wave, and if you haunt the retail stores daily or order online, you’ll probably get it sooner rather than later. If you don’t, though, you’ll have to wait for the wave to return in greater numbers–like Sand People–a month or two later. I suspect we’ll be seeing lots of wave 2 on the shelves come another month or so. By then, most collectors will have found them all at retail or broken down and bought them online, and so as the first shipments of wave 3 begin to trickle in, people will start complaining about all the wave 2 clogging the shelves and asking why they can’t get their hands on wave 3. As for my own experience, while I have seen wave 1 at all my local retailers, they’re still pretty sparse, and it’s usually the same characters (Orion and Red Tornado), which means Batman, Etrigan and the Penguin must be selling pretty well. I’m optimistic about DCUC. Marvel Legends has been going strong since 2001, and I think DCUC could easily have a similar life span, particularly with DC publicity boosts from movies like The Dark Knight. Here’s hoping we get the Four Horsemen’s interpretations of the world’s finest heroes for a long time to come. You make excellent points. Hopefully DCUC will be around for a long time to come. The sculpts and the beauty made me a fan. I'm someone who before DCUC, never really collected any DC stuff, save Zipline Batman from the original Batman line. Overall they're great figures that belong in toy aisles as much as they do in specialty shops. One issue that doesn't get brought up much is that it's also incumbent upon DC to build the brand and its popularity. Marvel has done that successfully, but DC continues to act like their mainstream superhero comics are Vertigo, and so kids who pick up the latest issue of Batman find themselves lost in the bizarre storyline Grant Morrison has going on right now. That's not a knock against Morrison–I'm enjoying "Batman R.I.P. "–but it's not exactly kid-friendly, and that goes across the board for the DCU. That said, I think "The Sinestro Corps War" was on par with any of Marvel's recent events in terms of quality and fun factor. But that's not the model DC seems to be using for most of their events. DC has been targeting an older audience than Marvel for years. I guess the question might be, should DC really have a mass market, comic book based action figure line? Does DC Direct relatively fulfill the needs of comics readers for figure collectibles? I'd say no, since I've hardly bought any DCD product, but I've preordered DCUC through wave 5. But that said, I do have concerns that the mass market line can't sustain itself if DC doesn't make an effort to draw in younger readers. Bother. Arctic Blast Batman is starting to look like a must have to me. I think I have a problem. I'm considering just cherry-picking DCUC 2: so far I just have Firestorm, and Aquaman's a must-have…but I do kinda want Grodd. Grodd's the best figure in the wave, frankly. And some of those figures (like classic Aquaman) are pretty damn good as it is. That reminds me, I need to preorder waves 3 and 4. I'm thoroughly enjoying the growing rogue's gallery of villians being put out. I think kids are mostly "into" what's currently playing on Saturday morning t.v. on the regular network stations. Kids want what they see in the shows and what's hocked to them during the show's commercials and the parents gravitate to that stuff when they're looking for what to buy. So DCUC won't register with kids or their parents (unless they spot an A-list DCUC character like Bats, Supes, or WonderWoman) and is really geared to those of us yacking it up on these boards who are nuts enough to pop $50 per wave so we can Click-n-Connect like silly. IMO.